A major problem in automatic weapon design lies in the mechanism for inserting cartridges into the gun chamber and removing the fired cases. In virtually all guns to see service, the cartridge is pushed forwards into the rear of the chamber, and the empty case pulled back out again. There is just one example of a variation on this, the Russian Rikhter R-23 revolver cannon, in which the process is reversed and the cartridges are pushed backwards into the chambers from in front. This design feature causes problems because a high rate of fire requires the cartridges to be pushed and pulled violently to and fro. The mechanisms used to achieve this have to make large - and constantly reversing - movements in order to handle the cartridges. This exerts considerable stress on the weapon, requiring it to be carefully designed and strongly built. Even so, ammunition handling problems are by far the greatest cause of gun unreliability. Various attempts have been made to ease this problem. One of them is the revolver cannon, which has several chambers in a cylinder, rotating to place each chamber in turn in line with the barrel. This enables the cartridges to be loaded and unloaded in stages, slowing down the ammunition handling process. Modern revolver cannon were first designed in Germany in World War 2, and have proved highly successful in aircraft guns since the mid-1950s. Examples include the British Aden and French DEFA/GIAT range, the American M39, the Swiss Oerlikon KCA and the German Mauser BK 27. One oddity was the USN's Mk 11, which had two barrels. Revolver cannon have their own design problems, however. Their action is not smooth as the rotation of the cylinder has to be stopped for each shot, then started again. The gap between the chamber and the barrel has to be bridged somehow to prevent gas escaping. Finally, even if the gun works perfectly, the high rate of fire rapidly erodes the barrel. These difficulties explain the popularity (albeit mainly in the USA) of the rotary cannon, popularly known as the "Gatling" after the inventor of the first successful gun of this type. It is rather like the revolver cannon except that each chamber has its own barrel permanently attached and rotating with it. This eliminates the problem of the chamber/barrel gap, results in a much smoother action as the gun spins constantly when firing, and solves the barrel wear problem. The disadvantage (there are always disadvantages…) is that the rotary is very bulky and heavy by comparison with other types, and (especially when power driven) takes time to accelerate up to its maximum firing rate, which can be a disadvantage in aerial combat. By far the best known rotary gun is the American M61 "Vulcan", but various other types are made; not just in the USA but also in Russia and Switzerland. Unsurprisingly, much ingenuity has been devoted to finding better ways of chambering and extracting the cartridges. One of the more successful attempts was the Dardick "Tround", which utilised a strong plastic cartridge of triangular section. The gun was a revolver, but the chambers were open on the outside. 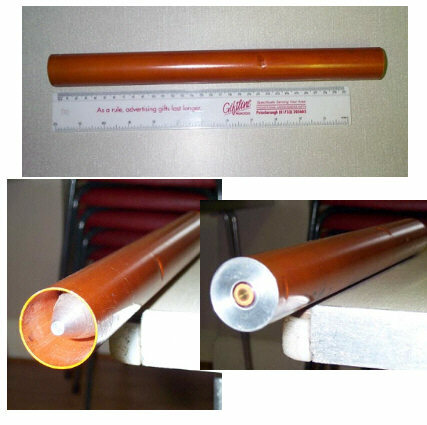 The cylinder was encased in a strong sleeve, except where the cartridge was loaded and the case ejected. The operation was very simple; the cartridge was dropped straight into the chamber through the gap in the sleeve, was rotated in line with the barrel and when fired was supported by both the cylinder and the outer sleeve, which combined to form the chamber. A pistol using this system went on commercial sale for a while, and machine guns and cannon were experimented with for many years, but not adopted. The principle of opening up the chamber to permit sideways loading has some obvious advantages. The cartridges no longer have to be pushed and pulled but drop straight in and out again. This simplicity enabled very high rates of fire to be achieved, albeit with the same problems as other types of revolver cannon. The added problem is in ensuring that the cartridge is fully supported on firing, as otherwise the case will split under the pressure. A drawing showing the operating principle, taken from Chinn Vol. 5, is shown below. An alternative approach was the subject of experiments in the UK in the 1950s, as part of research into future aircraft guns. It was a split-breech gun, in which two cylinders, each with several deep semi-cylindrical grooves along their outsides, were held side by side and rotated in opposite directions. The rotation was so arranged that grooves from each cylinder came together to form a perfect cylindrical shape; the gun's chamber. The cartridges were dropped between the rotating cylinders and collected by the grooves which, for an instant, formed an all-enveloping chamber, at which point the cartridge was fired. This action led to the nickname of "Nutcracker". The advantages of the Nutcracker design were smoothness and simplicity of operation, with the potential for an extremely high rate of fire. The disadvantages should also be apparent. 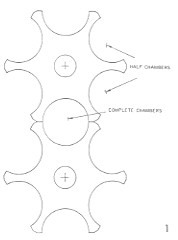 Each chamber was only formed for a brief instant as the cylinders rotated; any mistiming in a cartridge firing would leave it partly unsupported, leading to splitting along its length. There would also have been the usual revolver problems of sealing the gap to the barrel, and excessive barrel wear. As far as this author knows, no written material concerning these experiments is available (if anyone knows more, please email me!). However, it is probable that the designers needed to stop the rotation at the instant of firing, partly to ensure that the cartridge was supported and partly to keep it lined up with the barrel until the projectile had completed the transfer from the cartridge case to the barrel. This would have slowed down the rate of fire and spoiled the smoothness of the action. The temptation must have been to minimise any such interruptions in the interests of a high rate of fire, but as the experiments failed it must be presumed that this dilemma was never satisfactorily resolved: reportedly case splits were not uncommon. 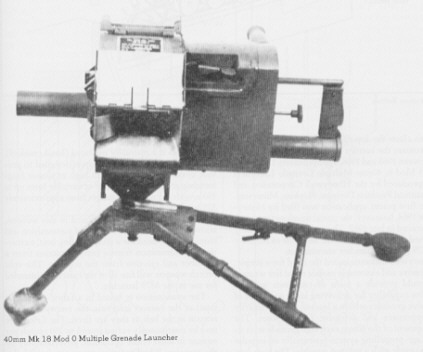 Despite this failure, there has been one technically successful example of a split-breech gun; the American Honeywell 40mm Mk 18 Mod 0 Multiple Grenade Launcher. It was the first attempt to produce a fast-firing weapon to supplement the single-shot M79 grenade launcher. It used the original low-velocity 40x46SR ammunition (unlike later automatic grenade launchers, which use a 40x53SR round generating a much higher velocity). Most unusually, the mechanism was manually-cranked using a handle on the side of the gun, so the rate of fire depended on how quickly the gunner could turn the handle. Design commenced in 1962 and approximately 1200 were built between 1965 and 1968. The design was basically the same as the Nutcracker, but with two important differences which allowed it to succeed. First, the rate of fire was kept very low (a maximum of around 250 rpm), and second, the cartridge fired was a very low-pressure one. Unusually, the rounds were held in a belt made of fibreglass tape (normally available in 25-round lengths) and they remained in the belt as they were passed through the mechanism and fired, further simplifying the design. A drawing of the design layout (from Chinn, The Machine Gun, Volume 5) is shown on the right. It will immediately be seen that the cylinders (or rotors, as they were known) could not rotate from the firing position unless they were moved away from each other; they then had to move back together again for the next shot. It will also be evident that the same problem would have affected the Nutcracker, complicating its operation. However, the Mk 18 remained a light and simple weapon, weighing just 8.6 kg and measuring 56 cm long. A photo of the gun is shown below. The Mk 18 was soon supplanted by the Philco-Ford M75 Grenade Launcher, which was power driven as well as firing the high-velocity cartridge. Despite this, the Mk 18 has a small place in history as a very rare example of a different approach to the problems of automatic weapon design. Finally, it should be noted that the split-breech approach was the subject of a US Patent in 1861 (#32,316), but does not seem to have been followed up at the time. However, towards the end of the First World War Fokker produced an engine-driven 12-barrel aircraft gun. Apparently this was not a Gatling derivative but a 'nutcracker' split-breech design, half of the chambers being attached to the barrels, the other half incorporated in a cylinder under the barrels. As with the Mk 18, the ammunition belt ran between the two cylinders, with no need to remove cartridges from the belt. Firing, apparently, was by a lever that was actuated by a cam on the drive wheel of the gun. Fokker claimed that 7,200 rpm was achieved, but knowing Fokker, there is some reason to assume that that may have been slightly exaggerated. Problems occurred, of course, with cases bursting on the seam between the two cylinders. The use of special cartridges (no details known) was not acceptable in wartime, so Fokker's technicians came up with two alternative solutions: Push the lower cylinder against the upper one at firing time by means of strong springs; or give the lower cylinder an eccentric movement with a cam pushing it into place at the right time. Apparently a prototype of the second design was built.